Take your tabletop presentation to the next level with this Silver Visions 7 1/2" heavy weight silver plastic knife! Providing all the look and feel of a stainless steel knife at a fraction of the cost, this Silver Visions knife is the ideal flatware for a variety of applications. Because this flatware is disposable, you won't have to waste any extra time washing large quantities of dishes. In addition, there is no longer any worrying about losing money due to expensive silverware accidentally being thrown away! The disposability offers tear-down convenience for servers and catering staff, without affecting the overall dining experience of patrons. The product arrived quickly, packed well, there were no broken items, elegant presentation along with disposable wedding plates, used for aunt's birthday party, would highly recommend. These Silver Visions 7 1/2" Heavy Weight Silver Plastic Knife - 50/Pack are nice the color is a shiny silver. The price is great can't wait to use them. For my wedding, I was looking for a utensil product that was fairly priced and was plastic. However, I did not want the item to be too cheap looking because my event is on the formal side. This product fit the bill perfectly! I am so pleased with how real the silver exterior looked and the quality to which they are made, heavy duty and could be reusable if you wanted. I would definitely suggest this product to friends and family members in the future! Looks like a real knife, we use these for weddings that are outside or at barns, or want to save money on using actual china. We will be using this stainless knife at our wedding for cutting loin and chicken. It is durable and will not break yet still totally elegant! Great Option! This product is very durable and keeps its shine! Slim packaging is great for packing! Has a great accent decor. Love the style and thickness! The knife is more of a butter knife can cut thin meats but not a big steak. I purchased these knives along with the Silver Visions spoons and forks. The knives, like the spoons and forks, are very well made. I did not notice any rough edges that can poke and snag. That’s a good thing because it keeps the product from looking cheap. For a plastic knife, I'm impressed. I had a piece of chicken for lunch the other day and it cut it up great. Compared to other plastic knives out their, this is by far the best I've used. I purchased these along with the forks for a casual wedding I catered over the summer. The wedding was outdoors & had a woodsy theme so metal utensils would have been out of place. These worked great! These silver coated knives and forks are great, they not only look great, but they are very strong and ok to use for potatoes and steak, i was surprised at this price point but we use for all catering now. Strong for a plastic knife. We served brisket and chicken and not one snapped. They're perfect for dinner parties because they really look like stainless steel! Great sturdy knives, not sure if they cut well as I havent used them yet, but design is great and cant wait to use them. Basic not top quality. This knife wasn't what I was expecting for a heavy weight one. This is ok for a basic need but I wanted something with a thicker quality. I used these for my wedding and loved that they were such a great price! They looked nice and I saved a bunch of money. These knives are very strong and shine just like polished silverware! Have the beauty of real silverware and no dishes to wash after the party is over! These knives worked just like the real thing. We used them for our meal of chicken breast and pork tenderloin and there were no issues at all. The Silver Visions plasticware is perfect for any occasion. I always have them ready for easy entertaining as the quality brings a touch of class. Webstaurant Store always gives great service and has the best price. I've been using these for many years and I'm always happy with them. Amazing plasctic knives. They look real without the cost and hassle of real. They are perfect for weddings and other event that you want to look special. THESE ARE GREAT, NICE AND STURDY. THEY WILL FOOL YOU, THEY LOOK LIKE THE REAL SILVER WEAR, THEN YOU PICK IT UP AND IT'S NOT, PLUS THE PRICE IS RIGHT! We ordered the plastic knife for my daughter birthday party. Silver visions knife was of good quality and the silver color was perfect as we expected. They are so affordable and heavy duty. They truly look like silverware and will add and elegant touch to our wedding day. I highly recommend these. Used these for my wedding and they were quite nice. You're not fooling anyone that they're not plastic, but they're sturdy and comfortable in the hand. We have since used them for ribs and chicken and they don't bend or break. I was really surprised by that! If needed, I would certainly repurchase these. The knives were perfect at our bridal shower. We received many compliments from people thinking they were real silverware. Would recommend them to anyone wanting a real silverware feeling. This knife looks really nice for a plastic utensil, but it's not heavy weight at all. It doesn't feel bad, similar to any plastic utensil, but it does look a lot nicer than most plastic knives. These knives are a nice step up from your basic plastic cutlery and add a nice elegant touch to an event. I would definitely buy these again! These worked so nicely for my wedding a couple years ago. They look classy like real silverware and are nice and sturdy! We used these for our apps, main entree, and dessert. I really like these silver weight plastic heavy knives. They look cool and matalic colored. Easy and sturdy to transport back and forth. Good job! Great Forks, always useful at parties! better than the usual plastics spoons we get at the store. I order in bulk all the time to make sure that i have them on hand. Heavy duty spoon, we used these for a catering and bartending job we recently did and they worked out excellent. Nice color and feel and appear as real silver. I was super hesitant to order these disposable knives but super happy when they arrived. We are using them for our wedding and felt they are super sturdy! I'm happy to report they will hold well for the wedding! I still remember the first time I ever saw fake metallic silverware. It was so hard to wrap my head around it because it looked so real! But then when I picked up the knife it threw me for a loop because the weight was so off. The metallic coat to these knives will definitely have you thinking that they are more expensive than they really are. Some are a little scuffed but you have to remember, these aren't real pieces of silverware. They look nice and serve their purpose. All for a price that will make you forget the little flaws! I bought these because I was looking for a superior disposable product. This knife is perfect. Sharp enough to cut through chicken and steak. Looks like metal. This knife has the look of a real silver knife, but is disposable. It does bend, but seems fairly sturdy. It is also very shiny and reflective but shows scratches easily. Amazing product line. No one notice the different between the real items and this product.. Great product will buy it again in the future for any other events. I bought these for our wedding reception and i think they will be just fine! I pushed on them pretty hard and they did bend a tiny bit but not enough for me to be concerned. I think for the value they're just fine! nice silver fork. I uses it my daughter 's quinceanera party. they are strong enough to cut chicken and beef . I recommend it to use it in any formal event that you have. Nice quality, heavy weight plastic knife with a "metal look"...exactly what I was expecting. Planning to use these for my wedding reception and we're happy with the quality. If you are looking to save money by using plastic cutlery these have a very nice look. They are heavy weight and have a metallic finish which makes them look better then some other plastic cutlery. You can also get matching spoons and forks. Great item and a very good price. I have zero complaints about this store. It was so convenient to get on here, find what i needed and have it delivered right to my door. I needed this for my daughter's wedding and it was the perfect item. These look nice and much cheaper than ones sold at party stores. So if you need a large number for a gathering, this is the best place to order from. These worked great for our buffet and lots ok so much better ham lain plastic cutlery! We wrapped them up with our forks and they looked great! I purchased these for a large event I was catering. They were very well-recieved by the guests and had no issues with chipping or flaking. Sturdy and well made I love these for weddings and nicer events. Our guests are airways surprised they are disposable. They hold up well to cutting food. Definitely recommend. I keep using them and recommending them. Have you ever met a plastic knife you can actually cut with? Me neither, until I got these. I can't decide which impresses me more - the fact that these are so pretty and actually look like silver, or the fact that they cut through Italian sausage casings and steak without hacking at my plate like a savage. The Silver Visions Heavy Weight Silver Plastic Knives is the perfect match to the Forks. I used the silver set for a birthday party and the guests thought the set was real silver when they saw it! Some guests asked if I was keeping after use to wash and use again! Looks great! The Silver Visions utensils are asthetically pleasing and look like real silverware, but they still feel like plastic and they are much lighter than regular silverware. Some of the knives showed small signs of wear (some of the silver coating coming off). Thia pack of siver plastic knives are really great! They are strong and heavyweight and hold up really well, They look like real silver cutlery! I bought the silver 7" heavy weight silver plastic knife along with the fork and spoon to be used for my wedding. The silverware three piece set was of high quality and one of the best pieces ever used for a party. I would recommend the set and even individually. Each piece could stand on its on. The cost was inexpensive and worth it. Great alternative to stainless flatware. Price is great. It's much better than purchasing them locally in packs of 12. We keep a couple packs just in case extra flatware is needed or if guests want to take a plate after dinner. This knife IS NOT flimsy, so I gave it 5 stars as it exceeded my expectations. Beautiful appearance and definitely sturdy. No issues at all! These silver heavy weight plastic knives are perfect to use for a wedding. They look fancy, and are super durable and you can throw in the trash when finished. No washing! I ordered these for a wedding and I am very pleased with the look and quality. These are the perfect option if you're looking for classy disposables. Perfectly adequate silver-look disposable knives. No complaints about these! They look nice on the table and work well enough for my purposes at a dessert reception. These knives are not as heavy as I was expecting, but they still feel nice and sturdy and will hold up and look great for my wedding reception. A great silver plastic knife that is very heavy duty and cuts really well. It looks like real silverware and is great to have at outdoor events. I AM SO GLAD I FOUND THESE ON THIS SITE... I AM SAVING SO MUCH FOR THESE YOU CAN NOT BEAT THE PRICE ANYWHERE.... HEAVY DUTY PLASTIC WITH THE LOOK OF REAL SILVERWARE. Super disappointing with my knives I wanted to do elegant in the cheap way for my wedding so I guess cheap is cheap all my silverware is scratched with black stained spoons forks knives wedding is right around not sure what I'm going to do now. Thank you for your feedback! We are sorry your knives arrived damaged, a Customer Solutions representative will be in contact with you shortly! These plastic knives are pretty study and they look really nice. I won't be embarrassed to use them instead of renting real silverware, and you can't beat the price! These knives are definitely heavy-weight and were the perfect pairing for the silver visions fork for a dinner party that I hosted. I received many compliments on this product and will definitely purchase again when next I host a gathering. When opening the box the silverware had black spots all majority of the knives. The wedding is this week so I have no other choice but to use them. Thank you for your review, Tyrell! We are sorry these items arrived defective, your account has been credited! This is a great product for normal individual use on food but I would not recommend putting it out to cut up servings or samples. I bout these to hand out with batch of fudge but when i was using a knife that day the silver started to flake off aver sever use. We appreciate your review, Sandra! If you are looking for a different recommended product, please contact our Customer Solutions team. These cultery is beautiful! I order them everytime I plan an event.I used these for my wedding, and for church banquets.They look like the real thing!.They are a cheap way to make a decor on tables look expensive while being affordable. The length was fabulous. The silver color looked like the real thing. It looked fabulous in the cloth napkin place setting. It was very elegant. Definitely for 1 use only. Spots when you wash. These knives are very durable and look very elegant. These were used in a wedding and guests were amazed that they were plastic. Overall I would definitely recommend this product to other people! We used this for a 200 capacity catering job. Elegant and durable. You will not be disappointed with this products. We were pleased. We will reorder. Overall this is a great knife. It looks classy as well as being a super heavy weight plastic knife. Great for cutting all types of meats as well! Perfect size as normal/real silverware, and it blended well with the spook and fork wrapped in the napkins. Cuts just like an actual butter knife. These knives are of very sturdy quality and an affordable price. They will look very nice on the tables at my wedding. They make a table setting look fancy and it is perfect for a sit down dinner that doesn't break the bank. Great Product! I purchased these for my upcoming wedding reception as an inexpensive disposable option. They look pretty good, passable for real silverware from a far, & a nice shine. They cut pretty well too (see video). Not as big as an actual knife but an excellent alternative. Very happy with my purchase. This Heavy silver plastic fork can be used for beautiful table set on different occasions from wedding shower to wedding and other formal events. it gets the work done. I can't wait to use these for my wedding. They are cheap, look good, and are good quality. These are perfect for any occasion. I highly recommend this product. Bought these for my wedding in November. They are perfect, just what we were looking for. Sturdy and looks like a metal knife!! Can't wait to use them at my wedding!! Our guest thought this item was real silverware until the touched it and realized it wasn't . Looks great. Recommended it to several people that are having functions. Nice style of plastic knife and sturdy enough for cutting meat, bread, vegetables. Goes well with the other plastic ware by Silver Visions, more sturdy than the fork. Excellent quality and durable for event steak at events and weddings! Sometimes plastic knives do not hold up, but this one does! Feels great too! Used with girls from this site as well. Very durable.....and can actually use the knife without it bending, safe for children use too. Looks like real silverware. I Ordered these knives for my rehearsal dinner. I did a lot of research and found these were a really good option to real silverware and lot easier to just dispose after use. I decided to order 1 set before ordering in bulk and I was very pleased with the outcome. I will be ordering more of these now for the dinner. they were also a bit more durable than another similar brand I tried out. I would prefer these. These are fantastic - heavy duty and shiny. From a distance, they truly do look like real stainless steel. Perfect for a more elegant event or to impress an important client. Great, cut large portions for meat without breaking. They are awesome. Good price and good quality. They look like the real thing. You will not be disappointed. These are so much nicer than the silver plastic ware you find at local dollar stores and even local party supply stores. As a caterer, I use these at my "nicer" banquets. These knives were a good purchase. They looked great with my party plate setting and also cut well. Sturdy enough to cut food without breaking. Great quality! It was even a little sharper than you would expect from a plastic knife. Heavy duty and stands up well to the dishwasher. I bought these forks for my wedding they were very sturdy, with a lovely, elegant apperance and made clean up very easy afterwards really recommend this product. These knives are a really great alternative to clear or white plastic if it is a nicer event. The seams are a noticeable bit over all a great buy. Great disposable knife. Looks great and is a terrific alternative to hauling and washing silverware. Heavy weight stands up dense foods. A better value than local distributors too. I bought these with the forks and spoons for a formal event. They really made me smile. They looked like the real deal. I would buy them again. These plastic knives were durable, yet elegant looking. Perfect for special occasions where easy clean-up is key! Pretty enough for a formal event, yet priced for every day use! These knives are perfect to add a little class for less hassle. They have a nice weight to them. Much nicer in person. I was looking for a cheap alternative to stainless steel and got so much more for my money. We needed several packs for our wedding and these were at such an affordable price. Item is described as heavy weight but I wish they were just a little stronger. For the price they are great and worked just fine for what we needed them to. We bought the forks and spoons as well. Was looking for classy disposable plastic ware. Theirs definitely did the job. Easy clean up but also very classy, sophisticated, and formal. I will be reordering. Holds up well with sturdier foods. I actually use this for drop off catering when I have a cheese or spread that needs something like this to serve. Metallic appearance adds class. The knives really did the job. The look of real silverware was a nice touch for my event. The knives were a nice size, weight and able to stand up to my food. I really enjoyed the knives since I had no cleaning after. Looks amazing and held up with cutting meat and veggies perfectly. they are super stylish and were great for my friends wedding! Will most likely purchase again! great quality for the price. will never shop at the dollar tree or dollar general stores again - great for a large gathering or picnic! I purchased these knives for my wedding, I wanted the look of fancy silverware, without they hefty price and cleaning afterwards. I'm very pleased with these knives they feel heavy duty, and they're not just shiny to make them look like real silverware, but they also have a nice more "fancy" shape to them than your average everyday plastic knife. I feel like I could actually cut something with this plastic knife without issue, and for the price you can't beat it. Excellent experience with this vendor. The product arrived fast, well packaged and these plastic knives look almost real. I'm very pleased with the product and im sure it will be a hit at my event. Great product, beautiful appearance, great service - very impressed by this company overall!! I have recommended your products to our chef and I will definitely order more for my next event and personally! Elegant and sturdy knives! These were paired with the Silver Visions Heavy Weight Forks, and they were beautiful together. In photos, they look like real silverware, and I am very impressed with how elegant they looked on our wedding reception tables. The knives held up to use on a variety of heavy appetizers and thick wedding cake. I will buy these and the forks again for future events. Excellent buy for my concession stand. They are fancy looking and very durable. When I run out of these plastic kives I will definitely buy more. I could not be more pleased with the Silver Visions Heavy Weight flatware line. I ordered these for my daughter's wedding, and they looked wonderful! The knife had a good feel in the hand, and the serrations were enough to cut through chicken and ham. We had some left over and my mother-in-law thought they were nice enough to re-use and loaded them into the dishwasher. They held up and still looked great! So awesome value; cheap enough to throw away, but sturdy enough to re-use if you are especially frugal. These look like the could be real. The only difference is when you touch them. Bought them for a wedding and received many complements on them. These knives look very nice in person! I ordered a small set to make sure they would be perfect for my wedding & they are! A very hard plastic - they look like real stainless steel flatware for only a fraction of the cost! very nice and elegant I also brought the spoons and fork for a matching set. Looks real but very lightweight. Very affordable compared to other places. Awesome quality! They feel super sturdy and reliable for a wedding! Like my own wedding that is coming up very soon! I can't wait to put them on display! Used these for a graduation party. They came really quick and they look so real. They are definently heavy weight. They didn't break or bend like some plastic silverware. Would buy again. I utilized these knives along with some spoons and forks I ordered for my anniversary dinner- guest thought they were real. They were elegant looking and very durable. Yes I would recommend this product. I am glad I purchase this item. You cannot beat the price on these knives. For a disposable, they are surprisingly sturdy and sharp enough for cutting most foods. The silver finish gives them a clean, slightly more sophisticated look. I ordered two packages of these and they are heavy weight and durable. I will be using them for a 60th birthday in August. The ordered arrived as expected with no complaints. From looking through the clear package I did notice a few of them did come with some minor scratches, which is to be expected since they are touching each other so closely. They are not as appealing or realistic as another brand that I typically use but they will work for our intended purpose. The price, however, is the most amazing part; to which will make me purchase this item again for all my parties. Knives were great quality, strong and durable. None broke and even bent during use. Very elegant look similar to real silverware which is great for formal events. These not only look more like real silverware than most disposable silverware, but are nice and sturdy also. While not as strong as real silverware of course, but they did work well for cutting food at a BBQ. We ordered these knives, along with the coordinating forks and spoons, for our recent wedding reception. We received rave reviews and compliments on the quality and look of this plastic-ware. This product would be highly recommended to anyone looking for a functional and disposable option for any occasion; not to mention an easy transaction and affordable price. i bought these for a party and they were perfect! They are very sturdy and gives a more "real" look to the plasticware. The price is phenomenal compared to local options to purchase. Used the Silver Visions 7 1/2" Heavy Weight Silver Plastic Knife - 50 / Pack to cut cauliflower. Even thought he cauliflower was raw the knife had no troubles slicing through it. Practiced with this to make sure if could withstand a full course meal at my wedding. Worked out great! We can't wait to use them at our wedding next month. We wanted the look of real but the ease of disposable and for the price it was a no question. I purchased these knives in addition to the forks and I couldn't be more pleased. Realistic sterling silver look. Heavyweight and durable. These are going to be lovely wroth my table setting. Heavy duty knifes that are going to actually work and not break on my guests. I am super impressed with this product. Looks like real silverware as well. This durable disposable knife is an amazing product for any event. It looks beautiful as part of a table setting, yet is extremely convenient for cleanup. Best of all, it is very sturdy. Great product! These look a lot nicer than they feel, but they will get the job done and are definitely a step up from the typical white or black plastic stuff. I got these for my wedding and we're having BBQ, so I didn't need it to be too fancy, but wanted something a little nicer. These did the trick. As for feel, they are in between the hard, clear silverware that fractures really easily but a step up from the normal plastic stuff you'd get in a cafeteria somewhere. Most of the knives I received had some scratches on them where the silver coloring had rubbed off. They still function perfectly fine as knives, and they're very sturdy for plastic cutlery. Great quality plastic knife that looks like real silverware! We use these for catering events and everyone seems to love them. Cuts though meat easily. These knives worked excellently! No breaking or that annoying wobbly bending as you try to cut. I will definitely buy them again and recommend them to anyone. These knives are sturdy and attractive. They are extremely lightweight but get the job done without breaking. Great option for attractive disposable knives at any event. Very pretty sitting on the table for a wedding. We didn't use them for steak or anything, but they are solid enough for most uses. A very nice and elegant piece of plastic ware that almost looks real. Great for use with more formal events such as wedding or anniversary dinners. These knives are of good quality and durable. Perfect for any event. They look like real metal, but they are a little smaller than an actual knife. It was a perfect option for my wedding. Can't beat the price, and it arrived to my house quickly.I would recommend this product to anyone and plan on ordering again in the future. I used these for a wedding event. The look great. The price is better than any other website. I am definitely going to order these again. For a wedding on a budget these are perfect. i got the forks and spoon also. For price they look great like you should have payed more. The knives look like real metal. They are amazing for the price and the fact that they are disposable. Can't go wrong with this purchase! I used to order these at Costco by the set and was pleased to find this store sell them separate than the spoons and forks. There have been times when we did not need knives. Now I can customize my orders. The quality is as durable as a regular plastic utensil but receive the benefit of the look of real flatware. We used silver Visions knives for an event we had that we wanted to look upscale without the hassle of washing silverware at the end of the night. These gave the event the elegant look we were looking for! Note: I would not use this product for anything that has a tougher texture or needs cut, however for a general-purpose dinner, to include buttering rolls, this works great, and looks fabulous! Used the knives in a catered event. Very Sturdy cut meats with ease and looks just like a silver knife. Would definately use again for events. For the price this is a wonderful knife. At our formal Christmas dinner I used our silverware, then for the rest of the holiday season I used these. I had my doubts they would cut steak but was pleasantly surprised they did just as good a job as the sharp knives I own. They look great, are inexpensive, and everyone was impressed with them. I may use they as gifts next year. I know they will be appreciated. These knives have the look of real metal. They are definitely heavy weight. They have the ability to cut through most of the items on our buffet line without breaking. These plastic knives look just like real silverware. I used them for a 50th anniversary party and everyone thought they were real until they picked them up. They worked out great! These knives are just what we want for our low key wedding reception! We bought the same forks and spoons for the reception. They are more elegant than regular plastic forks and still disposable! Cant wait until the reception...Thanks! Very elegant looking disposable flatware! They also were sturdy and we they were serrated enough to nicely cut a bite of steak. I would highly recommend them. I love how realistic the Silver Visions 7 1/2" knives look and feel! They're heavy duty and quality plastic that are sure to have your guests fooled. They hold up to normal use at any meal, including cutting through chicken. I love these knives! These knives look just like silverware. Great butter knives.They brought a sense of elegance to the party. Very classy! I would definitely repurchase this product. Very satisfied with the quality of this product. It is made of a real heavyweight plastic that does not break when you try to cut something. This is simply a regular plastic knife in silver. Its definitely not heavy weight as described. For the cost its a good value but its merely your average everyday disposable item. Thank you for the review! We are sorry these knives will not suit your needs. For a more heavy duty knife, we recommend trying these WNA Comet 630155 Reflections 7 1/2" Stainless Steel Look Heavy Weight Plastic Knives instead! Excellent product! Surprisingly sturdy! We ordered these for a wedding, and we were very happy with the quality, the look and the price. Excellent value. These knives are good. I also purchased the spoons and forks for my events. The knives and spoons were better than the ordinary plastic ones, but the forks were not sturdy enough for my event. Best price for disposable dinner utensils. Good looking and much nicer than colored plastic. I would order again. Order more forks than knives because Knives don't get used as quickly. These knives are really great! We use them at all our parties along with the Silver Visions forks and spoons. If you want to make a great impression without the high cost of renting and clean up of silverware, buy these they are perfect. This knife looks very nice with the matching Silver Visions spoon and fork. It cuts food adequately, about the same as a metal butter knife. These knives are "just the right" utensil when needing one at a semi-formal setting. They are beautiful and do the job when needing to cut one's food. We have ordered these before for events and were very pleased. This time, not so much. The were very flimsy, a lot of them had chipped paint off them. We had ordered the spoons and knives to match but did not use because of quality factor. Very disappointing. Thank you for your review! We are sorry these did not arrive as they should have. A Customer Solutions Representative will contact you directly to make sure you are compensated. These knives I purchased for our daughter's wedding. They were very reasonably priced and the quality exceeded my expectations. Looking forward to using them next fall! I bought these knives in conjunction with the Silver Visions spoons and forks and they far exceeded my expectations. They look great and are a nice, sturdy weight. If you're looking for something a little bit fancier, these are a great alternative to standard plastic cutlery. Considering these are plastic the appearance can be deceiving. These knives are high quality and perfect for a wedding. I would recommend these to anyone in need of "nice" disposable tableware. We recently used these knives at a wedding reception for 100 at a remote location 3 hours from our kitchen. We weren't sure that the kitchen at the site would have enough matching flatware for that many people, so we coordinated with the bride to bring these pieces. They looked good and it was a huge time saver not having to wash up afterward. These knives are great for a dressier occasion. They come 50 to a pack and are a great price for the quality of the plastic ware. The Silver Visions knives are a fantastic product. The price point is much lower than that of competitors. I am going to use them at my wedding this upcoming fall. I think they will really give the place settings a classy look at a low price. These were ordered to go with the matching silver forks that were also used at a bridal shower. These are very sturdy and did not feel cheap at all. I have heard about other brands where the silver peels off. This was not the case at all! I would buy these again. I ordered these for my wedding reception and they looked and worked fabulous! They are definitely heavy duty as they stood up to cake, pasta, and salad with out breaking. These look like real silverware. I searched everywhere online for these. Even with shipping, this is the best price I found. We will be using these at our wedding in August. I ordered these to go along with my spoons and forks. These were used for my wedding. Very strong utincils, could even be used more than once. This isn't only very nice but it's also functional. I used these at my mother-in-law's birthday and my niece decided she wanted to use them for her wedding. This knife is about what I expected. It looks like the real thing, but does feel and act like plastic. The blade cuts decently well.. The knife is quite thin, but it gets the job done at a great price! The Silver plastic knife looks like a real knife. I pare it with the 7" silver plastic fork. They look great and really sturdy, are able to cut chicken without any problems. These are beautiful. Without picking it up, you wouldn't know it wasn't metal. Completely surpassed my expectations. Would highly recommend for disposable flatware when needed! The knives look amazing. I was very pleased with the quality of these knives. I am using them in my wedding and am confident that they will look great. These plastic knives look real. They are really silver, I had to put a real knife next to it to compare. They look real and classy. Worth it. I ordered these for our bbq outdoor wedding, we we on a budget but still wanted to keep it classy. This product helped give us the look we wanted at an affordable price, they were also durable enough to cut through the pork and beef we had on our buffet. great quality and very sturdy. Knife looks very elegant. We use these for all our drop off catering events. We will definitely be reordering these. We used these for a baby shower and got lots of compliments on how real they looked, the silver color brought additional elegance to the event. Very strong and elegant look. Looks great with the set of other utensils. Pretty impressive for plastic silver and I can't wait to see it on my wedding day in the table settings. These were ordered for our wedding reception dinner, great product and great price. The price is great as well! They will be great for our dinner. Having used grocery store products in the past, i really wanted to up-grade my disposables. This knife is sturdy by comparison. I will purchase again! These knives worked well for a catered wedding reception at an outdoor facility. They held up well to the foods served and looked classy while still being easy to dispose of at the end of the night. Nice product and durable! I useded these for my wedding and they looked real and yet clean up was a breeze because we just threw them away afterwards! Very good product it cuts very like a stainless steel knife I will purchase again for next catering event. A good price for product guess was impressed. The knives I purchased are sturdy and definitely can be used for a formal occasion. They work best with the matching plastic forks and spoons. This silverware is a real asset to any place setting.you can barely tell the difference from real silverware it was a real show stopper. The weight was heavy and the feel like real silverware. I used the Silver Visions Plastic Knife, Fork, and Spoon with the Fineline Silver Splendor plates collection for a church function. Everyone commented that the table looked gorgeous! They were a perfect match. Great knife at an excellent price. Silver plastic knives are heavy and do not break easily, they work great with the forks at our annual pig roast. This product is unbelieveable makes my table look elegant , it put a touch of class to it, you will not know it is a plastic. l love it and will buy it again . Used these knives for our babyshower as well. Our meal consisted of bbq chicken quarters. Needless to say they were very durable and sturdy and worked better than the dollar brands. These knives are of great quality. They look very much like real stainless steel knives. Nice and shiny. Perfect for soft to semi-hard foods. Clients love them. These were beautiful and heavy duty enough that I don't have to worry about my wedding guests breaking them while they are eating, like most of the cheaper plastic knives I looked at from other companies. I was glad to find such a great product at such a fantastic price! Thank you Webstaurant for making my wedding planning easier and fitting my budget! i am always surprised by the people that want to save this plastic knife instead of throwing it away. i will continue to use this product and the price is unbeatable. I checked many other websites and this is the best one I found! The quality Is great as well as the price. We are very pleased. These knives look like the real thing. The blade end is thin but can cut much better than I expected. Makes for a very nice table setting when combined with the matching fork and spoon. I would definitely recommend these for a quick and easy setting. Great knife. We like all the silver visions heavy weight plasticware. Makes the table look great. The knife was sturdy and able to cut food properly. I purchased these for my daughter's beach wedding. They are of good quality and look nice even though they are disposable. I am very happy with this purchase. These knives are gorgeous! I used them for several parties and bbq's and everyone commented that I was getting fancy. They almost look real and they are strong enough to cut food. Will purchase again and again. You can't go wrong with these knives! This line of disposable flatware is now our go to product for all of our caterings. Folks just can't believe that these are made of plastic and not metal. These heavy weight silver plastic knifes are stronger than the usual plastic knifes. You could even wash them and reuse them if you wanted to. Great value and they look like the real thing. Loved this disposable silver ware. People thought it was real and asked where they should put the silver ware so it could be washed. Great product. These are so nice. They are going to work perfect for my country wedding. They dont look cheap and are budget friendly highly reccommend these. These silver visions knives are a great alternative to ordering Reflections due to the lower cost. Clients always think they arr real. Great value too! Very nice knife. It looks impressive and similar cost of regular knives. Looking forward to using at several family functions. Really like the silver finish. These silver plastic knives are great! They look classy but at the end of the day you can toss them in the garbage with no mess! Great flatware for my wedding reception. Plus the fact I will be able to throw away when finished. Unless you really look close you can't tell they are disposable. These are beautiful and very durable. They made a great choice for the dinner and I didn't have to worry about cleaning up. The price....OUTSTANDING!! I price checked at the local party store and needless to say, for the exact same product, this price was the best. Great quality. These silver-look plastic knives looked great on our place settings, with large and small spoons, soup spoons and forks. The generic style allowed us to mix and match brands which was important as not all brands carried each size cutlery (soup spoons and mini spoons in particular). The prices at Webstaurantstore for ALL the varieties were far better that what I could find anywhere else. Fantastic alternative to silverware. Color is very realistic. Weight is nice, held up well to cutting roast beef & pork. Exceptional value over other suppliers. These knifes are NOT the kind of knifes you would buy in the store. They are much lighter, but look really good still. I wouldn't trust this to cut through anything too tough, but for the price this is a great deal. At first glance it is hard to believe these are not real metal flatware. Heavy is an understatement, these knifes worked well with all food served at our celebration meal. Very good quality...used for my sisters wedding and will be ordering again soon for my own wedding! I would recommend the use of this product to anyone. Summer living just got more elegant. Really impressive especially compared to the usual plastic utensils and much more sturdy. At a glance you don't realize they are plastic. I ordered these plastic knives for my daughter\\\'s wedding. I was impressed how real they look. Compared to my metal knife, the plastic Silver Vision knife is a little smaller but still realistic. These knifes are very sturdy. I use them indoors and outdoor. They are very clean looking. I would recommend them to anyone. A very good investment. These knives are great! Sturdy enough to cut through NY strip or Prime Rib dinners. I use these for everything from corporate parties to weddings. The picture makes them look a little more real. They are great, but I would suggest for a sweet 16, as opposed to a wedding. Unless you are having a garden wedding, and stainless flatware was not an option. they are very nice, but they do look plastic. I had everyone thinking I was going to have to do dishes after my big family party, they look so real. These helped add some elegance and made clean up a breeze. Knives were sturdy and did the job! Much better than the cheap white ones! Combined with the Silver Visions forks these made for a nice looking table setting on a budget. Purchased for a wedding dinner. Not only are these very budget friendly, but also very classy & elegant. These knives are very shiny and helped to make the entire table service look beautiful. . .better than dull, stainless steel rental flatware. WELL WORTH the price, and nothing to wash afterward! These plastic silver wear look great, they really look like the real thing. They are a great value for the price, way cheaper then other websites. Great value! These knives can hold up to just about any meal. We served chicken at our wedding and these knives were able to do the job! I purchased the SV knives and forks and loved them both. They look like real silver, so they are a nice addition to a dinner table setup, and they are sturdy too, perfect for cutting meats. At my church we used these for the dinner to honer all the ladies. the utensils were very sturdy and worked well for the steak and chicken we were eating. they also looked very pretty. i was very happy with them. I was very impressed with this knives. They look very realistic, sturdy, and they do the job. a lot of our guest actually thought they were real knives. We got very good compliments for this items. They were combine with other cutlery items sold here. Great quality. Perfect for catering and outdoor events. Silver color gives a very professional look. Much sturdier than your standard plastic silverware. We used them for our wedding reception. Great value for something that looks so nice that is disposable. At first glance these look like metal flatware. A great alternative to cheap plastics. I purchased all three Silver Visions,knives, spoons and forks for my daugher's High School graduation party and had many comments on the "fancy" cutlery. inserted each set in a specially folded napkins so when guests started to arrive the impression of it all was excellent. If you want a classy event without spending too much, I would highly recommend Silver Visions producs and specially this site, Webstaurantstore. I LOVE IT and will definitely come back for my next celebration! 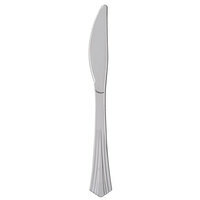 Made of strong plastic, but looking like real silver, these plastic knives are an easy and affordable way to add some class to your buffet or banquet. Love 'em! I used these for an outdoor wedding reception that I catered. Both the Bride and the mother of the bride were mazed that they were plastic, and they added the right touch of elegance! Great pricing too! Great item! Pretty silver color makes for great look when entertaining. Look great even though it is plasticware. No washing dishes is the best part! Customers always think that these reflective plastic knifes are real from a distance! Add some class to your parties or catered events, and buy these durable and classy Silver Vision knives! These knives look like solid silver or stainless steel. The cut very well despite being plastic, and do not break. All your guests should love them! I was a little skeptical to use these knives, but my worries went away very quickly when to my surprise they cut through food quite easily. The style of these knives are very clean as well, definitely check out the spoons and forks too. Speaking from experience, this is a great product! They cut through foods quite well and more importantly they look great! Whenever we go out to catering events we always bring these and we always get comments by our clients about how neat they are. Highly recommend! I cant comment on the cutting ability of these knifes (we didnt serve anything that had to be cut) however they look great and are very good quality. They also clean up well if you are interested in keeping for reuse. These are so pretty and they cost about a quarter of the price of any place else I found them at!!! Great deal so happy I found these. Heavy weight knife is good quality. There were some imperfections and the silver color is a bit dark....not bright silver.....but a great value for the cost. The silverware is heavy and beautiful. I just love this pattern, it looks like the rented silverware that comes with the caterers. I love it and would recommend it to EVERYONE. The price is more than reasonable. I will continue to shop here as I have a great big party coming this summer. Thanks Webstaurantstore I will refer others to your site. Great price, look just like real silverware. very durable. It added to the table presentation and give the decor an extra special touch of elegance. This was purchase for a housewarming. The knives are very sturdy and will cut. They give you the look of real silverware and your guest will be asking you "Where did you get them from". I have seen them it over here places, but your have a unbeatable price. These heavy duty plastic knives are excellent for my disposable tableware. Guests can't believe how great they look. I will always use Silver Visions for my buffet. My sister used these for her wedding and they looked great. These were definately were a nice and affordable touch. I recommend these to anyone. Bought these for my wedding and they look great! I was nervous about having plastic silverware but these are definitely a great middle ground between tacky plastic silverware and overly-spendy silverware rental! Great price!